I don't have any kids, but if I did, or if I were one, I would imagine that being served purple "trees" would make an otherwise maligned vegetable considerably more appealing. I was never much of a cauliflower fan myself, I always feel that it needs quite a bit of dressing up before it's worth eating. But I thought this recipe was absolutely delicious, and that it was worth it's weight if only for the rice. Unfortunately, although the purple trick might work on children, it does not work as well on 27 year old veggie-phobic fiancés, who only grudgingly eat the cauliflower while devouring the rice. He's like the kid who picks out all the marshmallows from the Lucky Charms and leaves the oat cereal for his sibling. 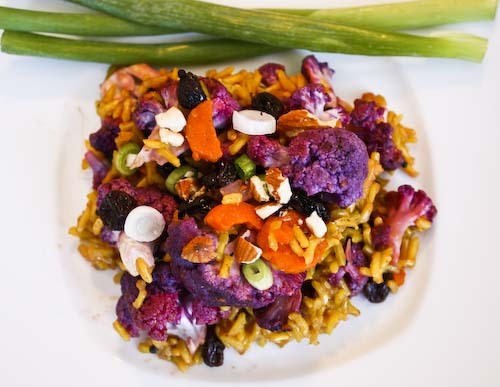 The dish I came up with began as Robin Asbell's Indian Red Rice Pulao with Pistachio, from her wonderful book The New Whole Grains Cookbook. However, for the red rice, I substituted basmati (which is what I could find, and which Asbell suggests if red rice is not readily available), for the pistachios I substituted ground almonds (not about to slice all of those almonds myself, but grinding is another story, and I didn't find toasting to be necessary) and for the dried currants we had dried raisins. The single biggest flourish I gave it was using purple cauliflower instead of while, which kicked up the aesthetics, but which tastes basically the same. 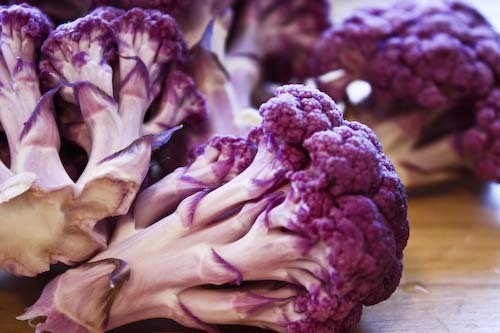 So feel free to use any kind of cauliflower you have, purple, orange, white or even romanesco, on which Almost a Chef has written a great post. Warm the oil over medium-high heat for a moment in a 2-quart sauce pan. Add the ginger and mustard seeds and cook until you can smell the ginger and the mustard seeds are popping a bit. Add the chili powder and tumeric and cook a brief moment more. Add the water, rice, carrot, brown sugar and salt and bring the mixture to a boil. Reduce the heat to low (very low), cover tightly and cook cook for 35 minutes without peaking. After 35 minutes, quickly add the cauliflower and the raisins on top, cover again and cook for another 10 minutes. After 10 minutes, remove the pot from the heat and let stand for 5 minutes more, still covered. Next, fold in the lemon juice, garnish with the nuts and scallions and serve. Love the colors - that looks gorgeous! 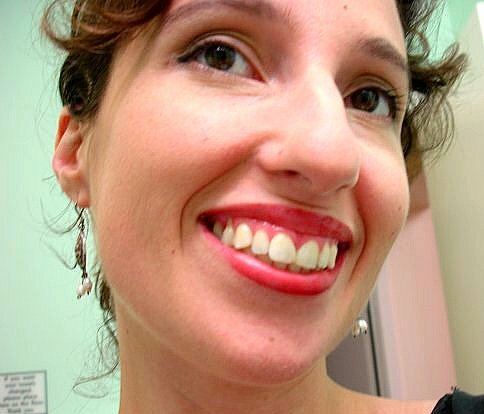 My husband sounds a lot like your fiance- picking out rice and the marshmallows! 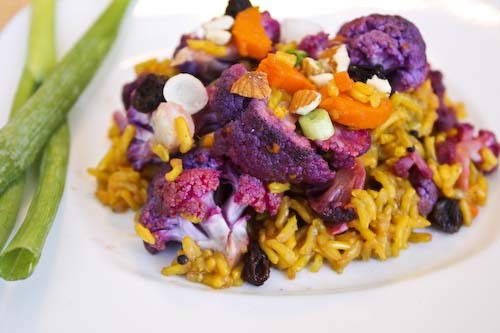 This dish looks beautiful and I love the colors- yum! Hi, I'm Robin Asbell- thanks for trying the recipe from my book! It's been great hearing back from people who have enjoyed the dishes. I'm working on a Vegetarian cookbook for next fall, I hope you will try that one, as well. Vera and Croquecamille, thanks! I thought it was a lovely dish! Anne, these boys sometimes, I tell ya. One day he'll eat his veggies! Robin, Thanks for visiting! I love your book, and I can't wait for the Vegetarian book! Yeah!! 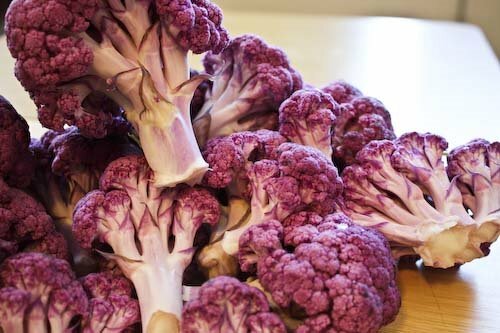 In Portugal I've never seen purple cauliflower. That really does look amazing, it's a work of art! What a gorgeous dish! It looks like a piece of art. That is a beautiful dish and I am one of those weird people who LOVE cauliflower. I even like it just steamed! I will definitely try this. Looks beautiful and delicious! I found orange cauliflower at the grocery store this weekend but passed it up since I didn't have a plan for it. 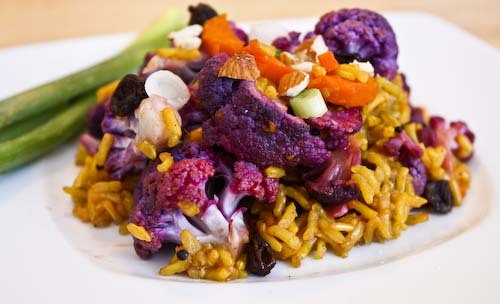 I heart cauliflower and this dish is SOOO colorful! I always try to make things as colorful as possible- brava! I would totally help you get over your souffl-phobia! I'll email you offline with a few essential stress free pointers. Moira, I'd never seen it either until I moved to NYC and found it at the greenmarket. I guess it's not that widespread. Dana, if you love cauliflower, then definitely give this a try. It's just as good cold and the next morning! Lisa, I know what you mean. I bought this a few days ago and was just hoping I'd find something to do with it! Hi Pace, I know you make everything look gorgeous. I wish I had your ability! That is one of the prettiest dishes I have ever seen! I love it! Wish I could find some purple cauliflower. So colorful.. It must have smelled great while cooking. Thanks Sticky, I was surprised how well the cauliflower held its color. I think I read somewhere that when you cook it it looses a lot of its vibrancy, but that didn't happen! Free Music, you're like my fiance. You can totally make the rice and leave out the cauliflower if you're not into it! Jude, thanks! It did fill up our little apartment. This is so beautiful, festive, and tasty looking that I might try it for a Thanksgiving side dish. Brilliant!